In 1942, the evolutionary biologist Ernst Mayr defined a species on the basis of their potential to interbreed and produce viable, fertile offspring. He described that speciation—how one species splits into two or more species—can result when populations of the same species become geographically separated over time, a physical separation that serves as a reproductive barrier. In his 1963 book, Animal Species and Evolution, Mayr described the outcome when different but closely related species come into contact, breed, and produce hybrid offspring. Despite interbreeding, the hybrids and their two populations of parents are identifiably different. Since hybrids are often sterile, this prevents the movement of genes from one species to the other, thereby keeping each species distinct. Hybrid zones are overlapping geographic regions, varying in width from hundreds of feet to thousands of miles, which exist between the populations of two closely related but genetically different species, including hybrids. Evolutionary biologists have been keenly interested in hybrid zones because they provide three possible examples of how speciation might occur in nature. If the reproductive barriers responsible for speciation become strengthened, interbreeding will end, and fewer hybrids will be formed. Conversely, if the reproductive barriers break down or weaken, the two parent species will be able to freely breed. Unlike the sterile hybrids, the gene pools of the two parent strains can mix, become more alike, and eventually fuse, becoming a single species. The third scenario involves maintenance of the status quo and the hybrid zone: the reproductive barriers remain intact, and hybrid organisms continue to be produced. Examples of hybrid zones and hybrids are seen in both plants and animals, with plants hybridizing more readily than animals, both naturally and through horticultural intervention. Plant hybrids are commonly fertile and capable of reproducing. Among animals, the liger is a hybrid of a lion and tiger, and mussels (genus Mytilus) actively hybridize worldwide. Not all efforts of hybridization are successful. The European honeybee was bred with the African bee in hopes of developing a tamer, more manageable hybrid. Instead, the killer bee was produced. SEE ALSO: Darwin’s Theory of Natural Selection (1859), Evolutionary Genetics (1937), Biological Species Concept and Reproductive Isolation (1942), Punctuated Equilibrium (1972). 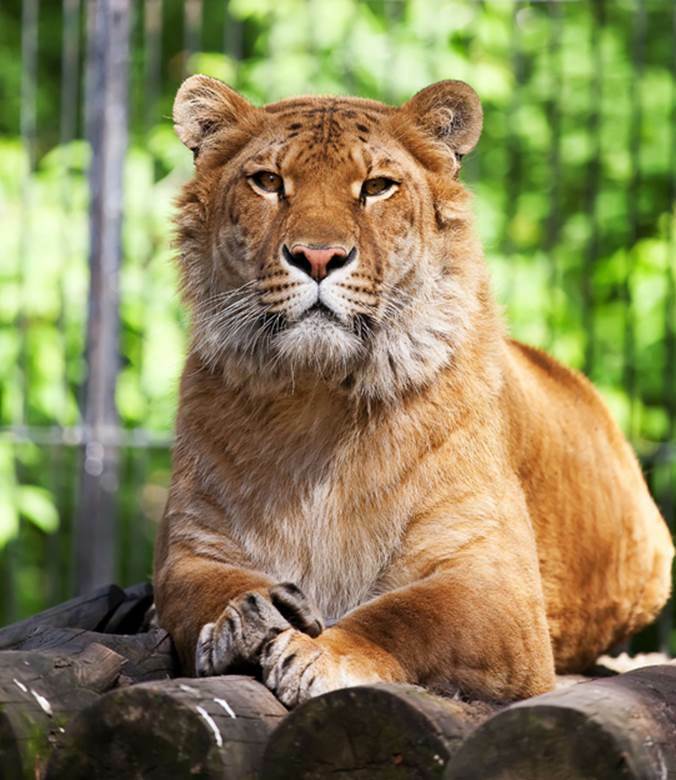 Hybrids are the product of mating two members of different species but the same genus, such as this liger, the offspring of a lion and a tiger. The hybrid shows the traits and characteristics of both parents and is usually sterile, preventing the movement of genes from one species to the other, thereby keeping both species distinct.